The ZAG range comprises 19 sizes of enclosure and are precision die cast in Al Si 12 grade (LM24) aluminium alloy. This is considered to be the most suitable grade of aluminium for maximum corrosion resistance especially in salt laden atmospheres. Additional optional protection methods such as Alochrome, anodising and epoxy polyester painting coupled with the fitment of captive, 316 grade stainless steel, lid retaining screws further enhance the anticorrosion properties of the enclosure. 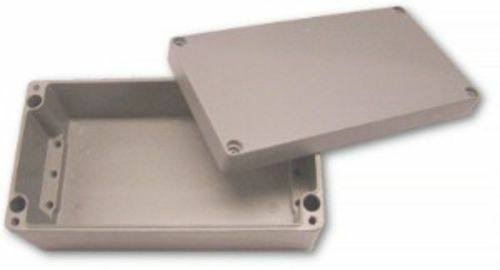 The wall thickness is sufficient to allow tapped entry holes to be machined in the walls or the base of the enclosure. Due to the enclosure’s labyrinth seal system, similar to that of the BPG range, whereby the seal is protected from external forces, the ZAG enclosure has excellent ingress protection qualities which mean that the enclosure is tested to and passed IP66/67. The mounting holes although contained within the profile of the enclosure sit outside the seal and all external fasteners and fixings are manufactured from 316 grade stainless steel to ensure reliability. External stainless steel mounting feet are offered as an option. The ZAG range has many features which lend itself to a whole host of applications including junction boxes, both industrial and hazardous area, and especially OEM applications, where the excellent machining qualities of aluminium come to the fore. The ZAG range can be machined, drilled, tapped with various thread forms and it readily accepts most paint finishes and colours. The ZAG range is particularly suitable for engraving of instructions and decals and this method provides excellent durability. Silk screen printing is also available. All of this can be achieved even in relatively small batches which make the ZAG range ideal for the small to medium size manufacturers who can achieve a custom enclosure economically. Earthing can be accomplished by various means. External/internal stainless steel earth stud which in turn can be connected to the terminal mounting rail or component mounting plate and various rail mounted earth terminals or proprietary earth bars can be fitted inside the enclosure. Due to the fact that aluminium is an excellent conductor, earthing for cable glands is provided through contact with the enclosure wall with no further earthing necessary. When fitted with a standard neoprene gasket the enclosure is suitable for ambient temperatures of -40�C to 80�C. Alternatively, when fitted with an optional silicone gasket the temperature range is increased to -70�C to 130�C. RFI screening is easily achieved using ZAG enclosures and the Abtech sales team can give advice on suitable RFI gaskets and finishing techniques which will provide optimum protection. The ZAG enclosures are suitable for use in hazardous areas and can be supplied with a number of certificates. ATEX EEx ‘e’ to BS EN 50019 (zone 1 & 2) EEx ‘nA’ to BS EN50021 (zone 2) and NEMA 4X (CSA, UL & FM class 1, div 2). The ZAG range can be supplied fitted with any component approved terminal to apparatus level or can be supplied empty as component approved for the clients own certification requirements.